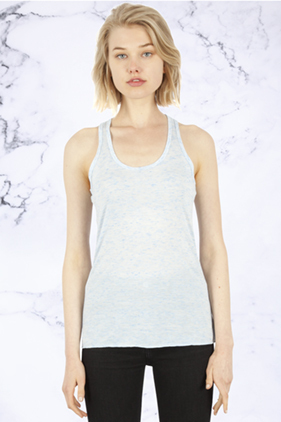 95% polyester/5% combed ring-spun cotton, 30 single 4.3 ounce women's caviar blend tank top. Self-binding neck and arm holes. Merrowed bottom hem. Pre-laundered fabric. Slightly flowy fit. Tear away label. South Korea fabric.